It's our newest podcast. Learn about the events that led to CLJII's fascination with comic book, move serial and pulp magazine storytelling in PART I of a revealing interview conducted by Bill Mills. Just click the audio player on the right. Then buy The Emperor iBooks, light-hearted thrillers with a scifi twist at Amazon, B&N, iTunes and other ebook sellers. Only $3.99. 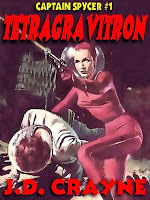 Labels: free pulp magazine classics, pulp magazines, science fiction pulps. Science fiction writer and reviewer, Henry Bott's review of Second Foundation in the June 1954 issue of Imagination: Stories of Science Fiction and Fantasy, seemed more a trashing of author and book than any legitimate form of criticism then, and still reads that way today. Bott's Filled with denigrating phrases unrelated to the content of the book itself that seemed calculated to injure the most impervious ego. Among them, "neither a writer nor a story-teller", "heavy-handed and ponderous", "elephantine prose", "endless philosophizing, (on a juvenile level)", "obscure sociological fantasies", "the soap opera of science fiction" and the clincher "it's not a good book!" Among other things, Bott seemed to have overlooked the fact that the Foundation series had been wildly popular with fans when it appeared in magazine form and readers were clamoring to see it in hardcover. That these declamations must have been hurtful to even so resilient an ego as Asimov proclaimed his to be. But with his usual mildness of temper, Asimov maintained a dignified authorial silence. Everything might have blown over had Bott had left it at that one review. But Bott didn't stop there. Just three months later, in the September 1954 issue of Imagination, Bott struck again with an equally scathing review of author and material when he took on The Caves of Steel. This time Asimov could bear it no longer and boiled over, albeit in the rather mild and harrumphing way that might have been expected of him. 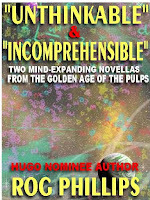 "Doubleday ordinarily produces much of the best science fiction printed today. Your reviewer has tried to be objective in analyzing this novel, but . 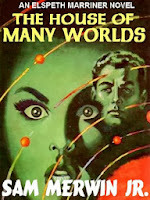 . .
"With that dubious beginning, I review another Asimov novel. ­Somebody must like his stories because they are published in an endless chain, but it is hard for me to see why. I think I shall be really "gone" if I must read another of these epics. "The canvas is of course, the galaxy—nothing less. There is the robot and the super-empire. "Using these ingredients in his inimitable way, Asimov hurls a furious barrage of words at the helpless reader. With Tom Swiftian naivete, characters move around in a really never-never world. Insipidity and dullness characterize the plodding story. This venomous condemnation of the story will not be shared by everyone, but then perhaps everyone has not read through the jungle of this sort of writing. When you have finished, you ask, "why?" "The murdered Spaceman, a corpse in steel-roofed New York's vastness, is remembered by the robot detective and ... you fill in from there. I need coffee after this one!" 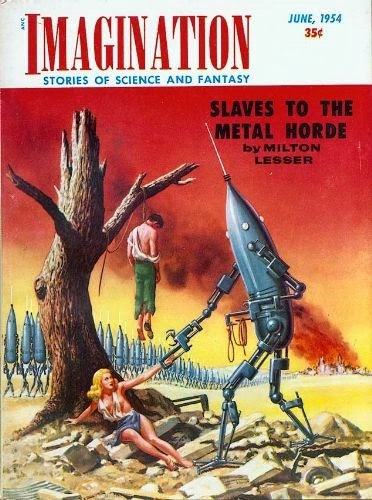 One might have thought that after two such provoking reviews, with no stopping in sight, the publisher would have anticipated a negative response from Asimov and fandom in general. And there was one. But perhaps that was exactly what publisher William Hamling and reviewer Bott wanted. For such a controversy was bound to bring readers to their pages and, in a Ray Palmer like move (and Hamling was a Palmer protege), increase the magazine's circulation. If so, Bott and Hamiling were right. Asimov replied the very next month in Charles Lee Riddle's noted fanzine, Peon. More a rumination than a broadside, the piece, titled "Why Can't the Author Meet His Critics?" was by turns incisive, insightful and philosophical. 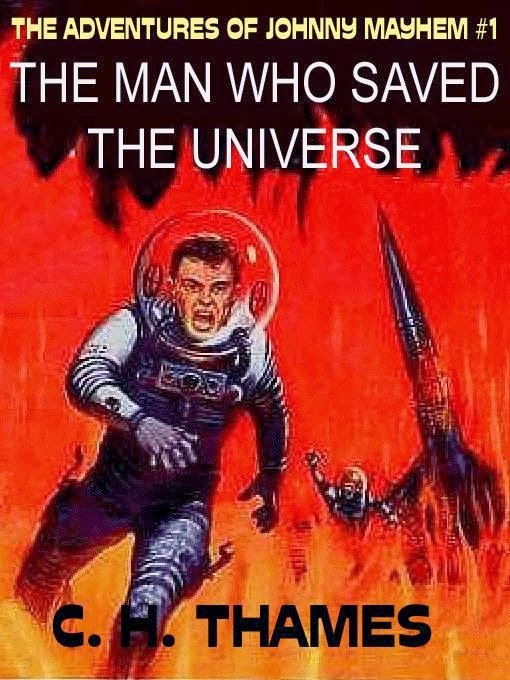 And it kept the subject on the front pages of the science fiction world. 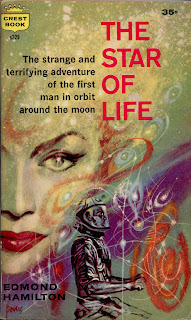 And watch for Asimov's reply to Bott on this blog next week. My publisher, Jean Marie Stine, was rather intuitive when she asked me some surprise questions about The Golden Gods, the sequel to Land Beyond the Lens. 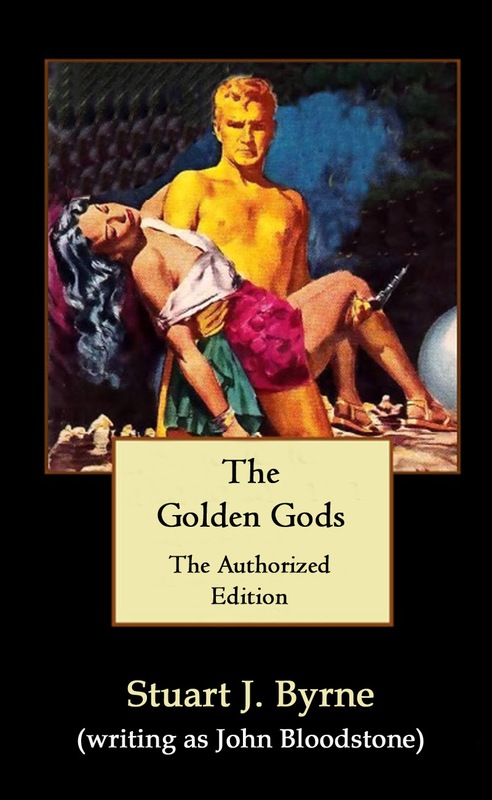 At first glance, The Golden Gods would seem to be a fairly traditional sci-fantasy sword and sorcery yarn, except for the ironical twist of handicapping the hero in the body of his enemy. But Jean Marie sensed that there was in this picture a broader canvas behind the frame. There is much here of alien language structure, and also certain subtle depths of metaphysical concept. She wanted to know more about this suspected background – or did I just put the story together haphazardly and make it all up as I went along? Well, she found me out. There is much to tell. As a former comparative philologist, I always had fun concocting alien languages in my stories. A part of philology is also phonetics, which has a direct connection with the law of consonant change in the evolution of languages throughout the entire Indo-European language tree. English itself is impoverished where some of the richer speech sounds is concerned, such as glottal stops and labio-palatal aspirants, and so forth. Some of the strange spellings of names in the present story attempt to represent some of these more exotic sounds, but they are handicapped by the limitations of the English alphabet. As to metaphysics, this was the real stretch of the canvas behind the frame, although at that time, The fact is that the essence of science-fiction and fantasy is that ineluctable Sehnsucht, or longing, in the human spirit to ever seek and find. To compensate for the frustration of being denied ultimate revelations, we all traditionally played the game of "what if," imagining what the Answer would be. It was once called the Utopia syndrome. But the game can take on serious dimensions if out of all the "what ifs" a viable allegory emerges. And this, I believe, intuitively went into the structuring of the present story. more than half a century ago, it was largely institutional. And the allegory involving twin god vehicles for Gurund Ritroon and his adored Mnir'sr Nikin'ra is but a broad stroke on the canvas to depict the golden androgyny of our immortal souls. The proof, that intuitive thought may not be recognized when it is present, was demonstrated to me when only now, before Jean Marie's challenge to explain, the realization comes to me that in the ugly countenance of the villain emperor, Gon'sr Lit'ri, was an obvious key to the metaphysical concept. The face of evil has but a single eye...! 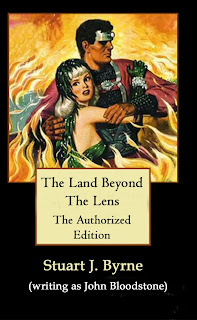 Get The Land Beyond the Lens Book I, FREE in Kindle at Amazon. 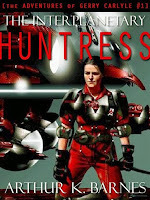 FuturesPast Editions Discounts Six Science Fiction Classics to FREE! Our New Year's Present to You! 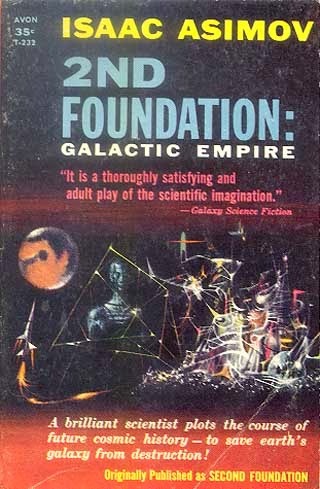 In the June 1954 issue of Imagination Science Fiction, author and reviewer Henry Bott, in his review of Isaac Asimov's concluding volume in the Foundation trilogy, Second Foundation, set off a firestorm of controversy. He ripped the book up one side and down the other, defamed Asimov's ability as a writer and panned the book. Second Foundation needs no defense, and the elements Bott decried make it apparent that he perceived nothing of what Asimov was attempting to accomplish philosophically. Bott was often perceptive in his book review column for Imagination, titled "Science Fiction Library." But less so in this instance, along with others who fail to perceive that the central them of the series lies in Mayor Salvor Hardin's assertion that, "Violence is the last refuge of the incompetent." The original three books in the Foundation saga are about nothing else, showing various ways problems that seem certain to end in armed conflict can be resolved sans violence by an astute thinker with the right strategy via a kind of psychological and sociological akido. 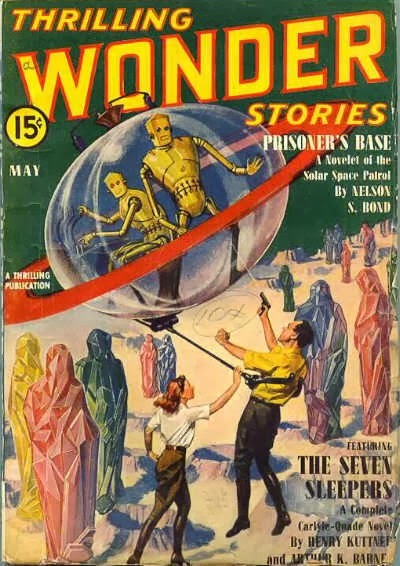 (Not surprisingly this was a theme close to the heart of the heart of the editor of Astounding Science Fiction, John W. Campbell Jr., who published the Foundation stories, and one that consistently turns up in the magazine's pages, as considered by many writers, throughout Campbell's tenure.) 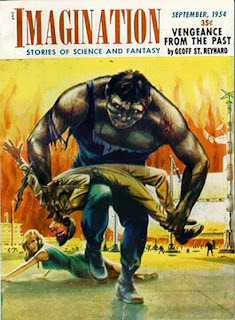 Asimov was understandably unhappy with such a slam review, and said so publicly in the popular fanzine, Peon. Bott and his publisher, William L. Hamling, would respond in the March 1955 issue of Imagination. The review that set off the controversy is below. by Isaac Asimov. 224 pages. Gnome Press, New York, N. Y. It was with difficulty that this reviewer read this book and with even more difficulty that he wrote this review; certainly it will bring down the wrath of Asimov fans. Isaac Asimov is an ,educated, articulate man, but he is neither a writer nor a story-teller. Heavy-handed and ponderous, Asimov grinds out ream after ream of elephantine prose about his ridiculous "Galactic Empire," filled with endless philosophizing, (on a juvenile level) obscure sociological fantasies, and massive technological monologues. Hari Seldon, Bayta Darel, Han Pritcher and Arkady Darel'skitter about the Galaxy, involved in improbable activities in the improbable "Second Foundation" fighting desperately to save themselves from the villain to end all, the "Mule." Second Foundation is a sort of modern Graustark. Asimov's preoccupation with kingdoms and empires would have been quite fitting four decades ago, but now . . . What connection this has with science-fiction is hard to understand. 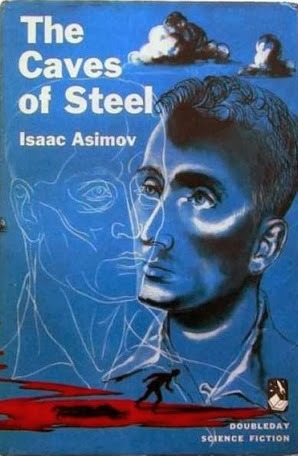 Asimov's stories are the "soap opera" of science fiction. 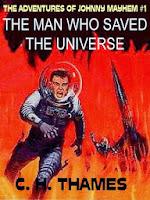 Not to be compared with the excellent "space opera" of Doc Smith or Campbell some twenty years ago! You might say, "Stop the vituperation—what's the story about?" I'll answer,. "Princesses and kingdoms, empires and galaxies and fairy godmothers. Even Mules! In short—nonsense!" Read it if you must, but don't say that you weren't warned — it's not a good book! Asimov's disgruntled response in Peon, and. Bott's reply in Imagination, will be published here soon in a forthcoming blog post. HAMILTON OR HEINLEIN - WHO INVENTED THE FUTURE HISTORY? 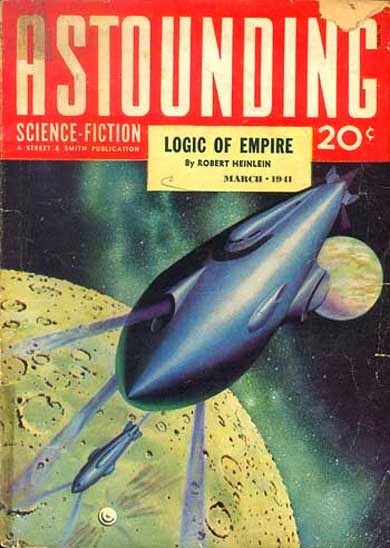 For decades, most science fiction reference works have credited Robert A. Heinlein with creating the field’s first "future history." In this sense, a future history is a fictional projection devised by an author charting what humanity's future might be like over several centuries or even millennia and against which many of that author’s stories are set. 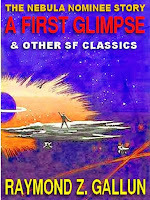 Familiar examples include Asimov's Foundation stories, Dickson's Dorsai series, and Brin's Uplift saga. much fanfare by the awe-struck editor, Heinlein presented his now-famous chart of one possible future course for humankind, indicating broad social trends, key inventions, and just where in the chronology various of his stories fit. Encompassing the colonization of other planets, a fundamentalist dictatorship in the U.S., interplanetary conflict, vastly extended lifespan, and eventual star travel (and pointing toward an increasing maturity in the human race as a whole), it was impressive then, and remains impressive now. earlier than Heinlein's in May 1940 – an event which appears to have gone unnoticed by genre historians. 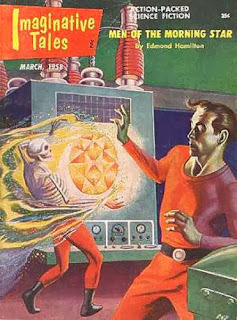 It may be that Heinlein's future history attracted more notice since it had appeared in the most successful and respected of sf magazines, the august Astounding Science Fiction (today renamed Analog Science Fact and Fiction), whereas Hamilton's description of his future history appeared in the less reputable pages of the lurid sf pulp, Thrilling Wonder Stories. 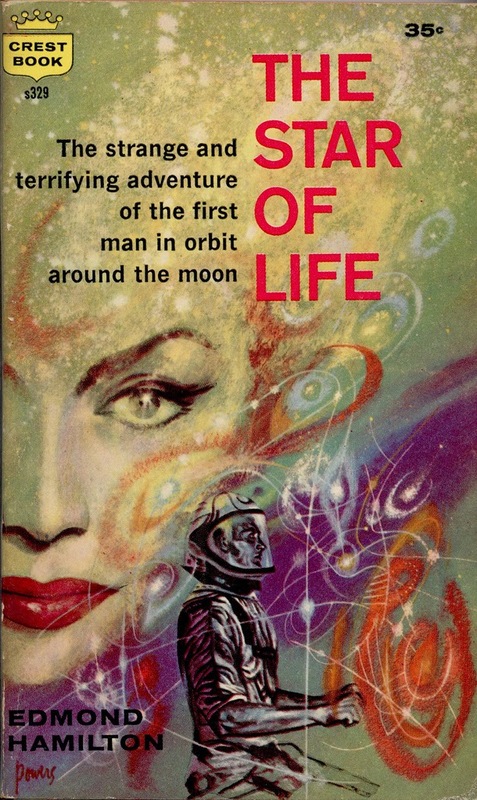 Hamilton called it "my 'History of the Solar System,'" although it followed humankind's destiny much further than that, much further, in fact, than Heinlein's. According to Hamilton, this history was the "most ambitious piece of writing I have ever undertaken is one that will never be published. It Is my 'History of the Solar system,' a nonfiction work to which I have been slowly adding for some time. "I began it as a simple chronology. It seemed to me that it was hard to write about the future if you did not have a fairly definite idea of your own of what the future was going to be like. A writer, I thought, ought to have some coherent framework on which to hang his tales of future events—then they would be apt to be more logical in each story. "I set up a simple chronology of the main evens in the Solar System as I foresaw them. Please understand I make no claim to be a prophet. Nobody can really write the history of the future until it happens. But this is my own particular guess as to the way it may happen. "I've tried to stick to this framework in my stories since then. It covers only the main tides of future history, the greater crises and changes. 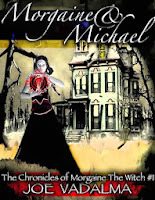 There is plenty of room In it for an unlimited number of new stories, I believe." 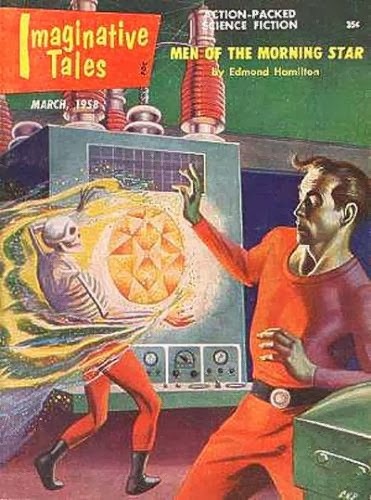 Ultimately this future history was to encompass the vast majority of Hamilton’s stories, from the early tales like Crashing Suns, Outside the Universe and Locked Worlds of the mid-to-late 1920s through his later, critically-acclaimed, mature works of the 1960s such as The Star of Life, The Haunted Stars and Star Hammer. It even encompassed the Captain Future stories, knitting all his work into a disparate whole. 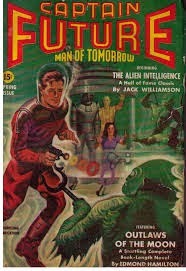 Various portions of this future were published in letters-to-the-editor and story-behind-the-story columns, as well as in footnotes to some novels. Below from the May 1940 Thrilling Wonder Stories “The Story Behind the Story” column is the piece where Hamilton first laid out a major chunk of his chronology and provided a bit of background on how and why he evolved his future history. Preceding it are the original editorial headline and introducing Hamilton’s somewhat informal essay. “The most ambitious piece of writing I have ever undertaken is one that will never be published. It Is my "History of the Solar system," a nonfiction work to which I have been slowly adding for some time. I began it as a simple chronology. It seemed to me that it was hard to write about the future if you did not have a fairly definite idea of your own of what the future was going to be like. A writer, I thought, ought to have some coherent framework on which to hang his tales of future events—then they would be apt to be more logical in each story. I set up a simple chronology of the main evens in the Solar System as I foresaw them. Please understand I make no claim to be a prophet. Nobody can really write the history of the future until it happens. But this is my own particular guess as to the way it may happen. I've tried to stick to this framework in my stories since then. It covers only the main tides of future history, the greater crises and changes. There is plenty of room In it for an unlimited number of new stories, I believe. Now and then one of my older stories, written before I started adhering to the History, bobs up in a magazine. But in the main, as readers of THRILLING WONDER STORIES and its companion magazines will recognize, I have adhered to my chronology. It may be interesting to give an idea of the scheme -of my History, by quoting here the titles of the first few sections of it. "EXPLORATION AND COLONIZATION, 1971-2011." This deals with the first pioneering flights in space, from that of Johnson to the moon in 1911, up to the successful colonization of Icy Pluto. This was, of course, an era of rapidly expanding Earth Influence. "THE FRONTIER ERA, 2011-2247" is the section devoted to the wild two hundred years in which the System Government, with headquarters on Earth, struggled to bring the half-explored nine worlds, with their colonists and native planetary peoples, under complete law and order, against the opposition of space-pirates, plotters and scientific criminals who In some cases actually threatened to overthrow the Government itself. "ERA OF INTERPLANETARY SECESSION, 2247-2621." takes up the fateful four centuries in which the various colonized planets began to drift toward a desire for independence from the System Government. 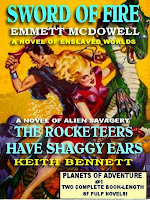 It describes the Martian Rebellion of 2463, the Swampmen Uprising on Venus. and the other bids for independence that the System Government struggled to put down. It ends with the date, August 17, 2621, when President Alderdice of the System government signed the fateful Recognition of Independence which recognized planets as free, self-governing worlds. “I need not go on with the History here, since the above will give an idea of its scheme. But, whenever I have had a little spare time I have added to this mass of material, sometimes drawing maps of the swamps and lands of Venus, or the mountain ranges of Uranus, sometimes writing a detailed little account of some event that particularly interested me. In fact, though I started the History simply for convenience, I soon found it a fascinating thing to work on." 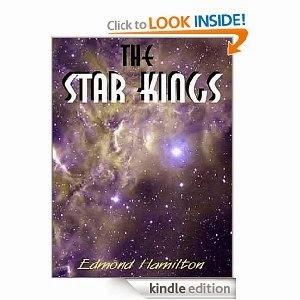 The climax of this twenty thousand year history is Hamilton's novel, The Star Kings, available from Futures-Past Editions in Kindle at Amazon for only $3.75. In this short piece from a longer phone interview, Stu Byrne describes an encounter with Richard S. Shaver and the infamous Dero, Max, in mid-1940s Chicago. Byrne also recounts two meetings with Ray Palmer, who first published the Mystery in Amazing Stories, that seem to offer substantiation for his claims. You can hear it by playing the lower audio player on the right hand side of this blog page. 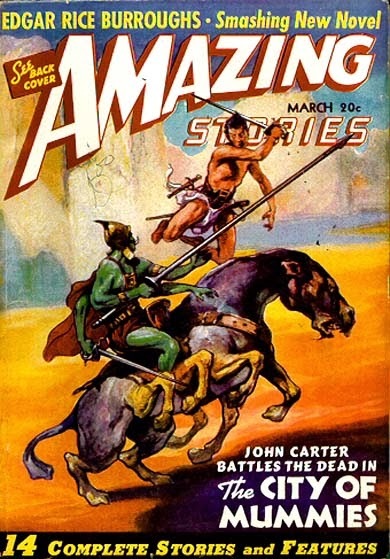 This is part 2 of a four part recounting of former Amazing Stories editor Raymond A. Palmer's 1955 attempt to persuade the heirs of Edgar Rice Burroughs to allow him to license writers to produce new Tarzan and John Carter novels. One of the greatest showmen since P. T. Barnum, Palmer realized that crossing the two series by having Burroughs' two most famous characters meet in a new novel would generate headlines, and millions in free publicity for such a book, around the world. 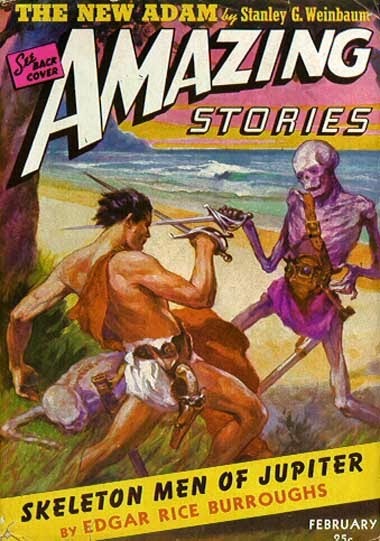 This was not the pure pipe dream it seemed, as Burroughs had written his last Mars, Venus and Pellucidar novels for Amazing Stories when Palmer was its editor-in-chief. If Burroughs had written for him, why would the estate turn him down? No fool, Palmer figured having all Burroughs fandom at his back and advance orders of 20,000+ copies would help cinch the deal. So, the canny Palmer started his campaign, not with ERB Inc., but with fandom via the science fiction magazine he now published, Other Worlds. He flung down the gauntlet with the November 1955 issue, which featured a cover by long-time Burroughs' illustrator, the immortal J. Allen St. John, and the headline: Tarzan Never Dies! still lives. And along with Tarzan, all our other friends, such as John Carter of Mars; La of Opar; Tars Tarkas, Jeddak of Thark; Manu the Monkey; The Great White Apes; Numa, the Lion; the Holy Therns; the Waziri; the Firstborn… and many more, none of whom will ever die within our memories where we cherish their wonderful adventures, never before equaled, and unequalled since. 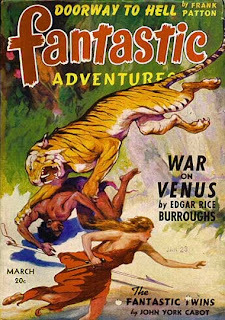 But Edgar Rice Burroughs, their creator, is dead. His typewriter is silent. And down the musty corridors of the world’s bookstalls stalk the ghosts of adventure, at bay at last, trapped in the past, never more to battle for their lives against impossible odds, nevermore to rescue their mates from dangers unmentionable, nevermore to thrill us, except in retrospect, with red-blooded adventure exciting beyond all imagination. Aye! It is a prospect to make even the gods weep! I knew John Carter personally. That’s how I knew how real he was. I met him much later than Tarzan, for I grew up with Tarzan. There never was any question in my youthful mind that Tarzan was real. Had anyone asked me, I could have answered triumphantly with his real name, Lord Greystoke, of England, and none could have swayed me from the conclusiveness of this proof! Today I might feel a bit sheepish about it, but the knowledge that I was not alone comforts me, nay, makes me proud. For here is vindication. 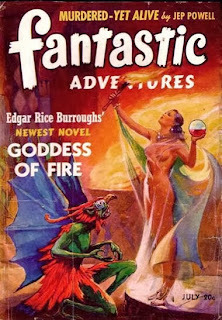 Here is proof of the real talent of the greatest of all writers, Edgar Rice Burroughs. He fooled me! Completely. Along with hundreds of thousands of others. George Washington may have been a myth, but Tarzan really lived! When I first met John Carter, he was equally vivid in my mind, and perhaps I loved him more than I loved Tarzan, because the bent of my mind was toward more fantastic imaginings, toward other worlds, lands beyond the stars. Yet, knowing he was fiction bothered me not a whit. When he lost his Dejah Thoris, I wept. When he found her, I cried with joy. When he carved his way to her side with his mighty broadsword, I screamed with excitement. And when he clasped her once more in his arms, I almost swooned with passion, such was my happiness. So, imagine, if you can, my pleasure at meeting him! Yes, I met John Carter. Not only did I meet him, but I planned with him his next adventures! And at my behest, novel after novel rolled from the typewriter of Edgar Rice Burroughs, all of those last famous books that mark the end of a great writer’s career. Yes, I treasure those last days. I was editor of Amazing Stories and Fantastic Adventures then, and as editor, I persuaded Edgar Rice Burroughs to write these new novels for me, novels that never have been written otherwise. I persuaded him, some think, to obtain the famous man for my magazines, to increase their circulations to the (then) world’s greatest in the fiction field. But I’m going to tell you a secret now that I’ve never told anyone before. 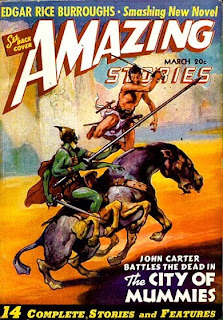 The real reason I worked so hard to convince Edgar Rice Burroughs to write for Amazing Stories, was because I was hungry for more John Carter. I, personally, wanted to read more of those magnificent novels! It was the most selfish action in the world, in one respect, and as it turned out, the most generous – for millions the world over enjoyed wit me these new adventures of those characters who can never die. The thought of that pleases me more than any memory of my past activities. To link my name with that of John Carter, in actuality! To be responsible for some of his adventures! What greater ambition can a boy have! What more tremendous attainment! Today, when I pick up my tattered copy of The Gods of Mars, I am overwhelmed with emotion. I handle the book as tenderly as though it were the most priceless of rare editions. To me, technically, this book is the best of all Burroughs’ creations. It is his masterpiece. It is within its pages that Mars becomes more real to me than my own planet! This book, and The Moon Maid, I consider the epitome of story-telling, true literature, examples of the writing art which can stand the assault of time, and which stand as targets for every writer who has his soul in his writing, and who desires to attain perfection. How many times have I re-read them both? You would smile and say: “He must know them by heart!” That I do! Oft in the night, I walk through the Valley Dor, musing upon the heroic deeds that once transpired here. Again, in my mid, I see Tars Tarkas, the giant Thark, as he battles beside John Carter, against the great white apes while the death call of the Holy Therns rings out from the high cliffs all about. And sometimes, after I drop off to sleep, my subconscious mind devises new fantasies so engrossing that awaking enrages me. Today I am still hungry for more John Carter. Oh what I wouldn’t give to pick up new novels and follow new adventures of all those wonderful characters I love so well, and who are more than characters, but real, living people. In my mind they stand beside the memory pictures of other living people, as equal as flesh and bold – and they will be ever so. In my mind’s eye, I can see Tars Tarkas’ great eye, twinkling upon me with ferocious humor, and a wave of affection sweeps over me. living death! Forever, like a puppet, he must now swing through the trees only on the vines of the past. All he can do is re-enact what he has already done. Not one more banth can John Carter slay, but only those already stiffened in their dried blood! The pity of it! For Tarzan is not dead! Nor are hundreds of questions we can ask that remain unanswered. One example: what about La of Opar? Is she never to attain any true happiness? Is that incredibly lovely woman doomed forever to remain among the troglodytes of Opar, with no prospect for a mate save a beastly half-human? You could, in ten minutes, phrase five hundred such questions. What about the ninth Barsoomian Ray; or the tenth? What about Kar Komak, that one lonely Phantom Bowman who became flesh? What about the religion of Mars, now left without one? Will the Holy Therns one day try to restore the ancient religion of Issus? The Great White Apes; what about them? Several times we saw them trying to become men – and almost succeeding. Will they ever succeed, and what will happen if they do? For years these questions have plagued me. The realization that they could never be answered caused an actual sense of sorrow, of loss. Sometimes I half-hoped when I saw a new Tarzan movie announced – and returned from it so sadly disillusioned that I swore never to go to another. No one, it seemed, could take up where the great Edgar Rice Burroughs left off. John Coleman Burroughs, his son, tried it. With all respect to a great man’s son, it just didn’t jell. stories, a personal friend of ours. There I saw several new pieces of Tarzan art. A new painting of Tarzan, a thrilling, nostalgic thing. But always it is the same – we talk of the glorious past. To St. John, Dejah Thoris IS the most beautiful woman two worlds have ever known. He has painter her many times. Her image is always in his mind as a mental model for any woman he paints. He loves her as much as John Carter does! Turning to platitudes, we say that in that Land where we’ll once more meet Edgar Rice Burroughs, perhaps he’ll continue the adventures of his characters for our enjoyment. How could it be Heaven otherwise! And on this last mournful note we sink back, reach for our tattered copy of The Gods of Mars, and retrace our steps into the past, for that is all we have left. And like introverts, we retreat into ourselves, and look out upon a world that has taken so much anticipating from us with a snarl of futility. Tarzan can never die, but he might just as well! T'would save the poignant pangs of longing that assail us always. And yet, the other day it happened. I could hardly believe my eyes, but when I realized what I had in my hands, I questioned not, or hesitated, but plunged into what has since become the prime adventure of my reading life – for what my eyes beheld, in words, was a familiar character, La of Opar, for whom the High Priest, patient no longer, had come to make her his mate. At last her most feared hour was upon her – and in her heart she knew she would not live the night through, for rather than mate with this horribly stunted, hairy beast, she would die at her own hand. One hundred thousand words later I was in ecstasy, the happiest man alive – for all my questions had been answered, and I knew at last what had happened to Kar Komak, who was the true Issues, and how Mars got back its ancient religion! No longer was The Gods of Mars the best of the Burroughs books – here at last was a better! Here at last was the supreme novel, the book for which all the others were only preparation, only plot-shadows casting before them the portent of the giant to come! Here was the book that welded the whole series into one complete, magnificent plot, cohesive in every unit, from the Apeman himself to Jason Gridley. And on the heels of this came the most unkind barb of all – for to read this great novel is forbidden! No man may read it. It cannot be published, for to do so is plagiarism. And this is one plagiarism that nobody could get away with. Legal action would be swift and relentless. Is there no way! we demanded. And the answer was as cold as ice: No, there is nothing to be done. If a man writes a novel for his own enjoyment, he can write what he will. He can use any character he pleases. It is legal. It is not plagiarism. But let him sell it, or publish it, and he faces the law. If a man wishes to build himself a patented machine, he can do so, for use in his own home. Even to the label. None can stay him. But let him try to sell it, and the patent law is invoked upon him. There is only one way: to get permission from the copyright owners or the patent owners. This novel that I have read (I cannot say who wrote it); would you like to read it? Is there a Tarzan or John Carter fan the world over who would not? Would you like to read this, and many more? There is only one way it will ever come about and that is to convince the copyright owners of a proposition I am about to make in the following words. It is presented to you readers as a challenge. The results will be up to you. I hereby propose that the Edgar Rice Burroughs interests nominate a successor to Edgar Rice Burroughs to continue the adventures of all his famous characters. 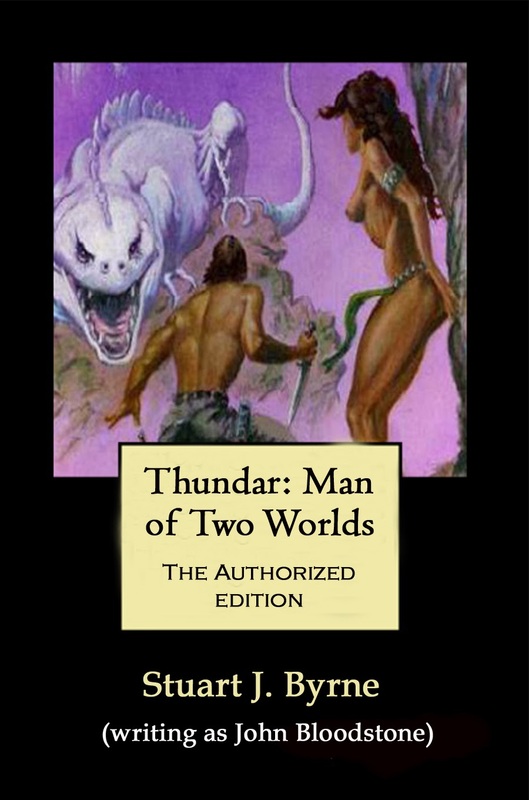 I further propose that they nominate a man who has proved he can continue in the high standard and tradition of Edgar Rice Burroughs, as based on 100,000 words already written. I propose that Tarzan and all his friends be allowed to live again, and walk once more through the pages of the books of the land, for the enjoyment of the millions of fans everywhere. Certainly the Burroughs interests stand to profit immensely. All the author requires is a fair remuneration for his work. He is willing to sacrifice all personal rights in the stories he shall create, except those which come under the fair remuneration already mentioned. In the interests of perpetuating these beloved characters, and making possible their future adventures, which I am now more hungry than ever to read, I propose to handle the task of convincing the Burroughs interests of their proper course, and of the huge fortune such a decision can and will make them. The way to accomplish that task is simple – that of public opinion. If enough public interest can be demonstrated, the rest should be easy. Therefore, to begin with, I am asking every Burroughs fan who reads this to send me his name and address with these simple words: “I’ll back you up on Tarzan!” When I have enough names and addresses, I will contact each and every one of you, and instruct you as to the next step. Can I get 100,000 names on my desk within the next 60 days? 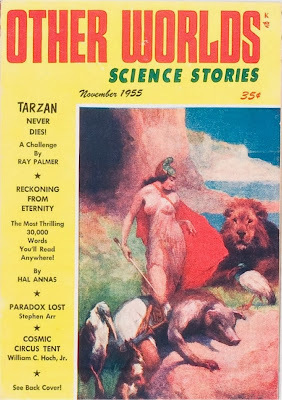 If you’ll send me yours, it will be a start – and if you’ll go out and contact every other Tarzan fan you know of, who might not read this magazine, and get him to do the same thing, it won’t be any trick at all! Naturally this is going to cost me money, and I’m prepared to spend it. I must spend it! It cannot be that this wonderful novel never become more than a pile of manuscript pages written for the personal satisfaction of one Burroughs fan who so loved his characters that he did a thing never heard of before – wrote his own novel, for his own pleasure, knowing it could not profit him a nickel! He has the world’s largest cross-file of information, concerning every book, every incident, every character in Burroughsiana. He is, to my mind, the only man who has both the ability, and the familiarity with the characters, necessary to continue the Burroughs stories in a manner undetectable from that of the master himself! If I fail, none of you will ever read what happened to La of Opar, and to Kar Komak, and to Tarzan and John Carter as they fight back to back on Mars. Nor will you ever know the identity of the man who has written it, for there is but one manuscript, and it is his. And it will be a great pity. If any of you care to assist me in the cost, say by sending a dime, I will put it into a “Dimes for Tarzan” fund, and use it to create the gigantic wave of public opinion which is the only possible way to convince the proper person that what I have proposed is the thing to do. But it is not really necessary, for I will do it alone if you do not wish to help. My own prayers have been answered, and my joy has overwhelmed me. For me, Tarzan is far from dead! Deeds unknown to millions of his fans, are already familiar parts of my memory of him – and what great deeds they are! I shall never forget that fantastic leap that Tarzan made that saved the armies of La, and of Tars Tarkas, from certain death in the rising waters of the Gorge of Tarnath. Nor shall I ever forget… but why speak of it? The mention can but whet an appetite that may never be satisfied. Send me your name and address, and tell me you are willing to help. If it were Tarzan, he would spring instantly to your aid. And all you have to lick is a 3-cent stamp! Do it now, and round up everybody else you can find. Write to: Ray Palmer, Amherst, Wisconsin.